For those who do not know what it is, the Campus Party is one of the biggest events of technology, creativity and digital culture in the world. Hundreds of participants (the “campuseros”) live together day and night for a week sharing information, knowledge, ideas, and obviously, having fun. During these seven days there are lectures, presentations, debates, workshops and competitions. So far it has been done in Spain, USA, Brazil, Mexico, Peru, Colombia, Ecuador and Germany, bringing together hundreds of hackers, developers, technology enthusiasts, gamers and geeks. Since its first edition in 1997, 222,406 people have participated in any of the editions of Campus Party. The organizers of the Campus Party, created a few years ago Campus Labs: a genuine Spanish crowdsourcing initiative based in Open Innovation. That is, companies pose different challenges that participants (“campuseros” in this case) are able to solve. Of all the proposed solutions, one at least receives a reward (sometimes several winners are selected). Below you can see a little diagram that clarifies Campus Labs way of working. 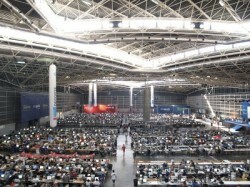 Thus, Campus Party gets contacting companies like Telefonica, Google, Nokia or Iberia, with hundreds of technology specialists. In the case of Telefónica, for example, they proposed a challenge that was aimed at creating new and innovative applications or services which incorporate the various APIs published in the “Movistar Developers Platform”. This case involved 594 people, leaving 123 as finalists. Three of these finalists were rewarded with a € 20,000 prize. The first winner was also incorporated to work in the R&D section of Telefónica. But not only can propose challenges companies but any person or institution. For example, the chef Ferran Adrià, who through Telefónica and Alice Foundation, proposed the creation of a mobile application that would help the young people who became independent to eat well. In this case 10 finalists were selected and the winner was rewarded with a cash prize of € 3,000 and an “inspirational” prize: to work in the Alice Foundation. One of the strongest points that this platform has, besides being one of the first Spanish Open Innovation platforms (in the style of Innocentive) is the crowd, the crowd that has gathered around itself. When someone begins a crowdsourcing initiative a question arises: from where do I get my crowd? Because it is clear that the crowd is in the Internet, but where? How can you contact them? And in this moment, user communities play a key role. In this sense, Campus Labs is a privileged platform: it has a user community of over 170,000 users, segmented in hackers, designers, beta testers, coolhunters, etc. As if this were not enough, Campus Labs is in contact with more than 600 communities and leaders of the Internet that allows the retransmission of the challenges to other users that have many other specialties and expertise.